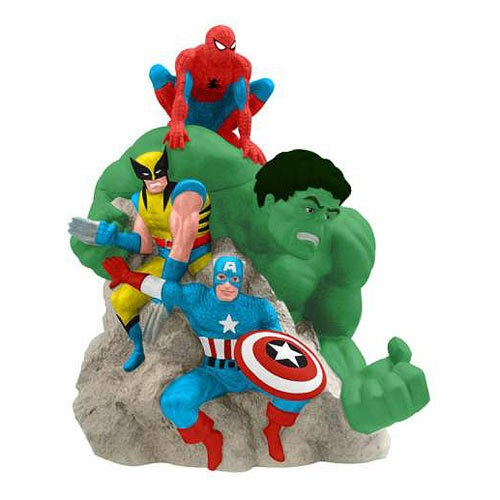 From the Marvel Comics Collection, this detailed Marvel Superheroes Cookie Jar features Wolverine, Spider-Man, Incredible Hulk, and Captain America. The ceramic cookie jar stands 11 3/4-inches tall and finds all 4 superheroes looking ready for battle, especially Hulk, whose left fist looks particularly frightening. While the Marvel Superheroes Cookie Jar might not be microwave or dishwasher safe, it does make a great place for cookie safekeeping!